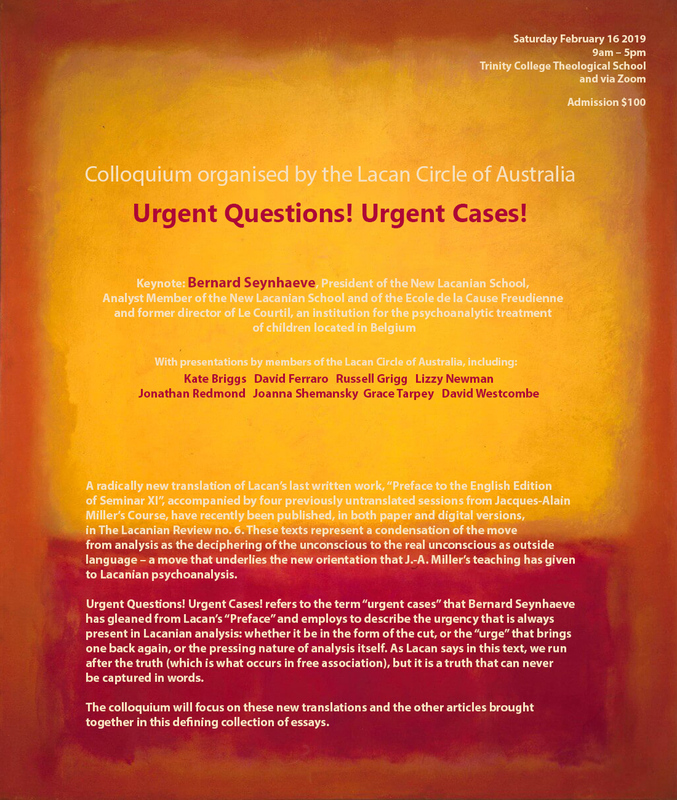 Colloquium organised by the Lacan Circle of Australia. This “urgency” is the traumatic moment when, for a subject, the signifying chain has been broken. The psychoanalyst is the one who listens to those who complain of an acute rupturing of the signifying chain. Here we find the analyst, not as an interpreter, but as making a “good pair” with those cases, where unconscious knowledge emerges in the space of a lapsus: bungled actions, signs and dreams that speak subjective truth via the irruptions of the real. Please join us at the Trinity College Theological School, Royal Parade, Parkville. If you cannot make it to this beautiful venue (and it will be a shame if you can’t), then it is possible to attend via Zoom, with picture and sound of the highest quality from this state-of-the-art facility. Coffee and refreshments will be served during the day. Registration is now open. Please either pay via bank transfer or use the credit card form below. We will also accept electronic transfers on the day from 8:30am.